Yesterday I recalled some Summer memories, today I'm glad to welcome Fall. As a kid I loved Summer, now Autumn is probably my favourite season. It can compete only with late May - early June period, when nights are the shortest. Вчера я немного повспоминала лето, сегодня я радуюсь осени. Ребенком я, конечно, любили лето, теперь оснь, наверно, самая любимая пора. Лучше золотой осени может быть только период в конце мая - середине июня, когда ночи самые короткие в году. I have many close people having birthdays in Autumn. And I felt very excited making this card, because I knew, who would get it. У многих моих близких день рождения именно осенью. И я с удовольствием делала эту открытку, потому что знала, кто ее получит. I enter this card to One Layer Simplicity Challenge #9 hosted by Ardyth. She says, it's hip to be square this month! I do not make square cards often, and even if I do, I make them bigger than Ardyth, mine is 5 1/2". Since it is one layer challenge, I made it in a bit more complicated way to get all these colourful layers. I followed Heather's instructions described here. Я выставляю эту открытку в конкурсе One Layer Simplicity Challenge #9 (Однослойная Простота), который ведет Ardyth. В этом месяце она говорит, что квадрат - это круто! Я редко делаю квадратные открытки, и если делаю, то размером 14 х 14 см. Так как обязательное условие конкурса - однослойная открытка, пришлось поколдовать. Я последовала примеру Heather, описанному здесь. Вкратце по-русски опишу: (1) я наложила самодельную квадратную маску, тонировала некоторые участки открытого квадрата двумы светлыми оттенками DI и подсушила их феном, (2) на тонированных участках сделала горячее тиснение листьев прозрачным порошком, (3) полностью затонировала весь квадрат и (4) отпечатала куружевной узор в верхнем правом углу. 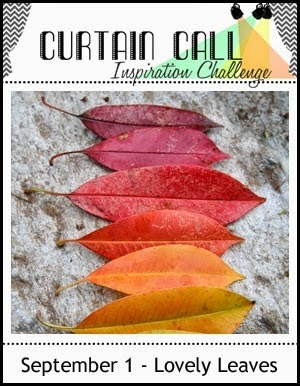 I link up this card also to Curtain Call Challenge, that invites to use Lovely Leaves. I was inspired by this degrade colours and tried to incorporate them in my card. Я также выставляю эту открытку в конкурс Curtain Call Challenge, где тема - Листья. Мне очень понравилось фото с постепенной сменой оттенков листьев. 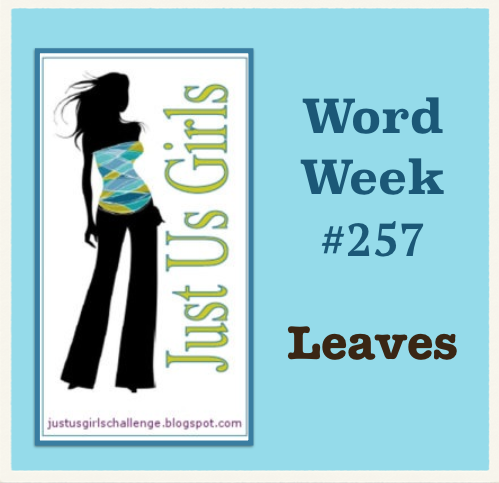 I'm playing along with the following challenges: Inspiration Emporium, where Fall is in the Air, Just Us Girls #257, The Friday Mashup Challenge 176, that suggested to use Emboss Resist technique. И еще я буду играть в нескольких других конкурсах: Inspiration Emporium с темой Осень в воздухе, Just Us Girls #257 - тема Листья, The Friday Mashup Challenge 176, где как вариант предлагают использовать Emboss Resist технику горячего тиснения для сопротивления чернилам. And The Male Room Challenge #18, themed Autumn/Fall. И The Male Room Challenge #18 с темой Осень. Thanks for visiting and leaving a comment. Have a nice Autumn day! Спасибо, что заглянули и за хорошие слова. Всем прекрасного осеннего дня! Amazing and brilliant!!!! Spectacularly beautiful!!! Really, really it is, love it!!!! Ps, if you can add one more challenge to the others, this is also perfect for the male room challenge, autumn/ fall and masculine.. This is divine, I hope the other challenge permit another additional, and you link up!! Just wonderful!!! I've checked, I think I can add one more challenge. So I'll play with TMR ;) Thanx! 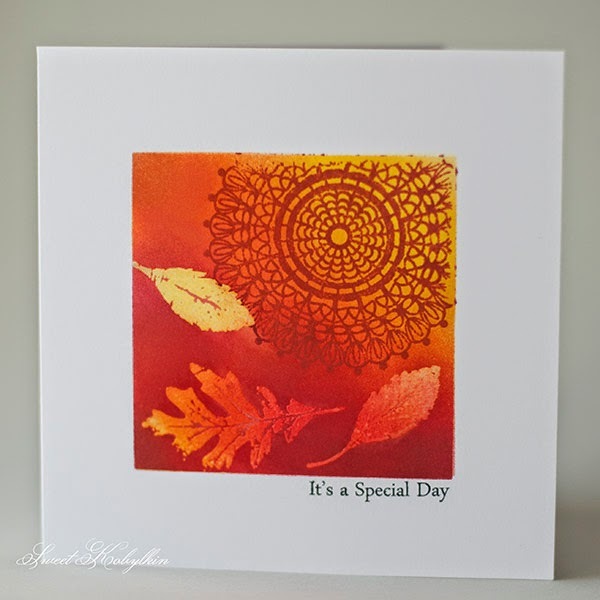 Love your fall colored card and how you used the emboss resist technique...beautiful! Thanks for playing with us at the Friday Mashup. Gorgeous fall colors, what a beautiful card!!! Thank you so much for sharing and joining us over at Inspiration Emporium's Inspiration Journal!!! Gorgeous rich colours, truly outstanding! 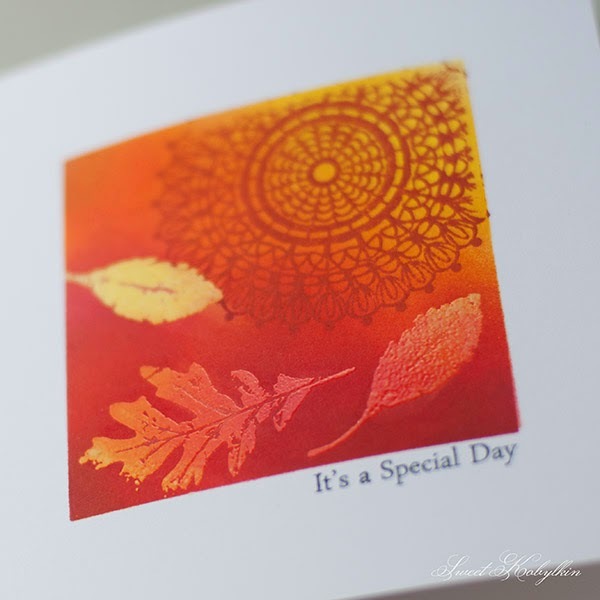 love the richness of your card - gorgeous!! Love the composition of this card! A real beauty!!! The subtle colors of the leaves....exemplifies fall!!! Thanks for playing along with us at Just Us Girls and we hope you will be back again soon! Gorgeous! Thank you so much for sharing with us at the Curtain Call! Beautiful design and colors! This is simply stunning. Thanks for playing with us at JUGS! I love the richness and depth you've achieved with the sponging of these warm colours! So glad you joined us at OLS! Beautiful card! Thanks for joining in at both The Male Room & JUGS! Great job at the emboss resist technique! Your card is beautiful! So beautiful and dynamic! A work of art! Stunning! Your colors are amazing! Thank you for sharing with us at Inspiration Journal! Stunning! I love the sense of depth in your one layer card. Thanks so much for playing along with The Male Room this week! This is so rich and colourful, it certainly caught my eye in the One-layer challenge. Just gorgeous!